The Collider is a machine built to decode the mysteries of human relationships. Its mission: to identify and understand the invisible material that passes between people – the corrosive, delightful and mysterious matter that keeps us together and pulls us apart. Forever trapped inside our own heads, can we travel across the cracks that separate us? And if you make it across – do you dominate, surrender or create something beautiful together? Created for two people at time, the experience guides each person in their journey through the machine. Each participant enters separately. Both are invited to reconstruct a memory of feeling either powerful or powerless inside a glass display stand – using an array of miniature figurines, props and paper. Deeper into the machine, their journeys converge. One enters a virtual world revealing the inner vision of the machine, the other can manipulate the visions and actions inside that virtual world. The experience culminates in an unmediated encounter where the pair work out, together, what has happened. From #metoo to Kavanaugh, Brexit to Brazil, The Collider moves from the political to the personal to ask: what do you do with power when you’ve got it? We make work that offers up metaphors through live physical interactivity: how does this action make me feel as I do it, and what does it remind me of? We think about how to use the metaphor of these interactions within a narrative. We try and use them to shape an experience that is both playful and self-reflexive. The Collider — from first idea to Tribeca premiere — took three years to make. With such a long gestation, many ideas and experiments got mixed into the journey. We were determined to make a piece that was more than a solo escape into an alternate reality, and we wanted to use the affordances of the hardware to reflect on the dynamics that might be alive in a room — and for that room to be a starting point for thinking about the wider world. 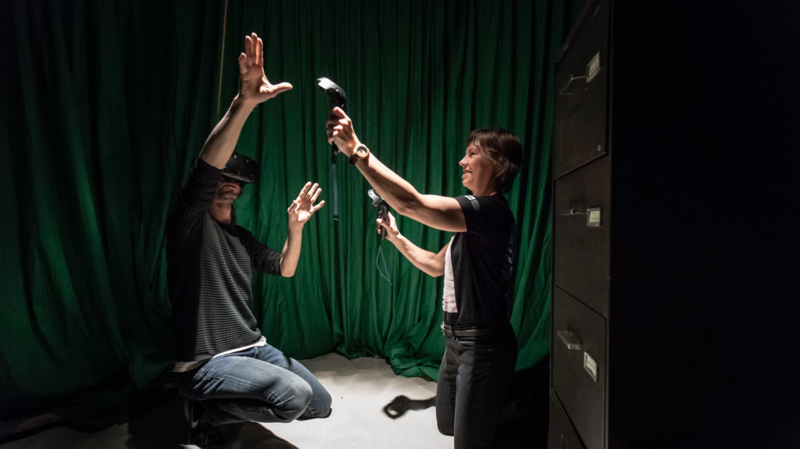 Having attended many festivals and VR exhibition spaces, we were always curious about what was going on around the person in VR in the room and the transition moment of being in the real world and then entering the VR world. 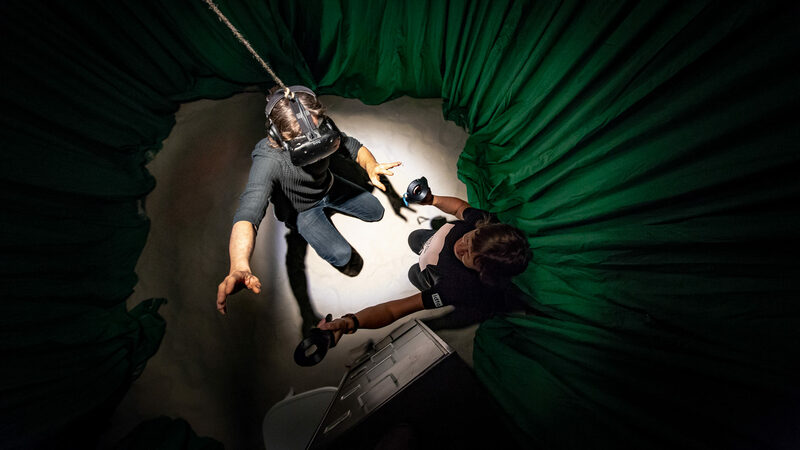 Simple practicalities — swiveling chairs, awkward ushers, sweaty headsets, other VR enthusiasts — would often be absurdly dominating, ruining any chance of the piece of work grabbing our attention in as immersive a way as was claimed. These practicalities, therefore, started to become more interesting. 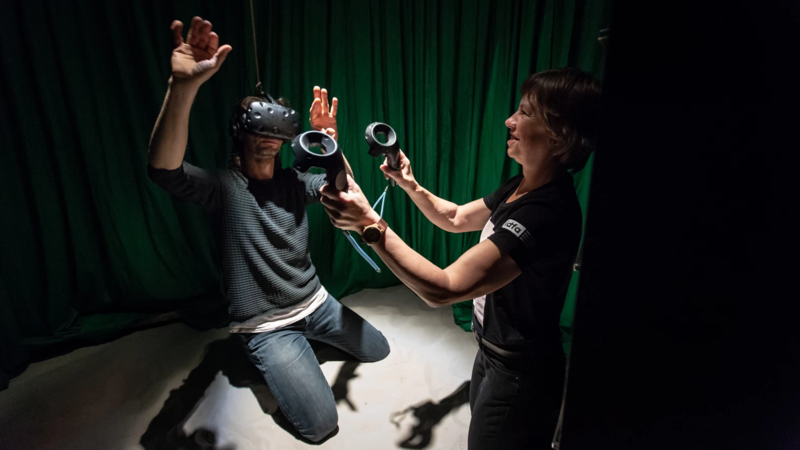 How could we work them into a narrative in a way that acknowledged the demands being made of the participant — to be “in” the VR, but also in your body in a material, physical space? With these observations and thoughts swirling around, we also felt that making work which is only possible with VR was very important. When one person wears a VR headset and another holds the controllers, you become tied together in an unusual way. The core idea was sparked by discovering the sensations that happen when one person wears a VR headset and another holds the controllers. You become tied together in an unusual way – one can see the VR world but not control it, and the other can control it but not see it. Both sides have a power and weakness – and you are both together and separate. This simple action seemed to speak of the distance that still exists between us as humans — even when we are close together — and of the power dynamics at play in that space. The movement suggested the choreography of a marionette and its master. Our thinking about power dynamics at a micro level coincided with significant public conversation that touched the same subject. From the election of Donald Trump to the #metoo revelations, it felt increasingly urgent to interrogate why and how we give power to others — and that we might crave power too. As much as the conversations were about broad politics, it felt that the inner experience of the individual in that was fundamental. What do you do with power? Do you want to hold on to it, or do you want to give it away to someone else? Ultimately, we wanted to make something where it was the action in the room — in this case, the dynamics of a relationship — that acted as a metaphor for something in the wider world. As a maker duo, the relationship at the heart of the making process was always in some small way an element in the piece — perhaps we are using the work itself to navigate our own lives. What surprised you as you were making this work? In the first public iteration of the work-in-progress version of The Collider at IDFA Doclab in November 2018, we were consistently surprised by all the weird and wonderful ways in which people would interact with the set. When you write a piece that asks participants to follow instructions and you design a set that invites interaction, you start to be attached to what you feel is the right way of doing things. Sometimes this happens — its runs to your imagined script — but there are always the ones who confound you and do something different. This is often delightful, strange and funny. You learn as much about yourself as you do about them. Why would I expect this question to result in this response? It’s a powerful tension between wanting to curate an inner journey with a strong narrative and giving people the freedom to bring their own energies and ideas to the work. Making The Collider has taken quite a few years, in fits and starts. If anything, that fact is just a simple reminder of how hard it is to get work of this nature funded — you have to be willing to play the long game. It is also testament to the niggling strength of the idea that we stayed interested — it felt like an exciting thing to return to in the scrum of the rest of our projects. Without that sense of continued interest, these sorts of projects would be dead in the water — but it is still a challenging element, that you need to keep on being able to put it back in a box and then return to it later when it might feel remote. What we have found most interesting in the making and presentation of the work in progress was the way that different combinations of people would have very different experiences. In one way, that feels exciting and alive — that the piece presents a set of circumstances to which people have to respond — but it also feels risky, and getting the conditions right so that it feels accessible and at the same time sufficiently challenging is always hard. Anagram are an award-winning creative company specializing in interactive storytelling and immersive experience design. Almost all of their projects use technology in surprising and recently-possible ways. However, the team firmly believe that an experience should not be about technology unless it is actually about technology – so even through there is a lot of innovation behind the scenes to make these experiences work, the average audience member may never know. At its core, the work invites people to consider what it means to be alive today, in this society and alongside these people. Through understanding the experience of others, they seek to challenge the way we see ourselves and the world around us. 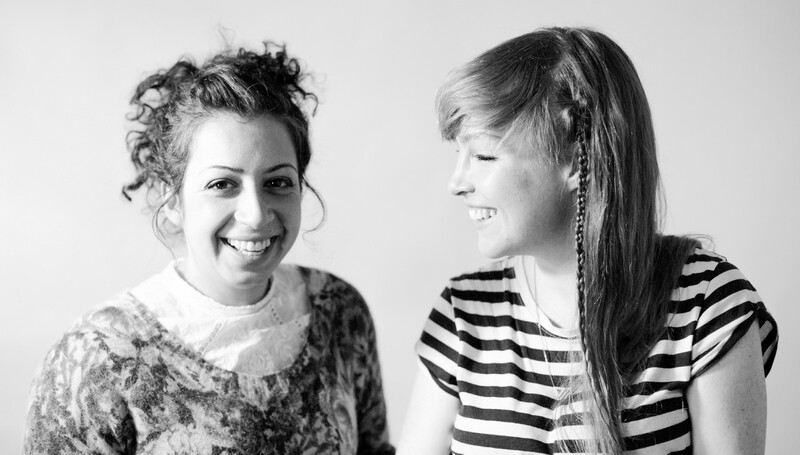 The core of Anagram are Amy Rose and May Abdalla, two ex-documentary filmmakers who in April 2013, during a residency with Blast Theory, decided to form a partnership. Their intention was to make stories that would be augmented by movement and actions taken by the participant, and to explore what meaningful agency in a story might look like. They are based at the Pervasive Media Studio, a dynamic space in the Watershed on the docks of Bristol, England. An earlier project, Door into the Dark, was named to the 2016 Digital Dozen. “Virtual Reality is often (and sometimes quite rightly) accused of isolating participants, creating encounters that transport you away from yourself and cut you off from social contact. In The Collider, Anagram seem to be addressing this head on. . . .